Who are your favorite siblings? 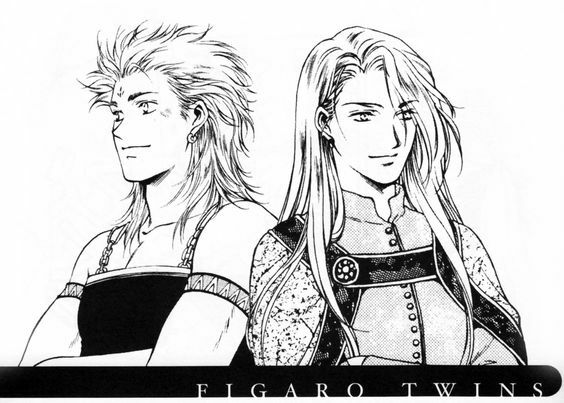 Definitely the Figaro twins from Final Fantasy VI. I had a thing for Edgar when I first played it, unsurprisingly. 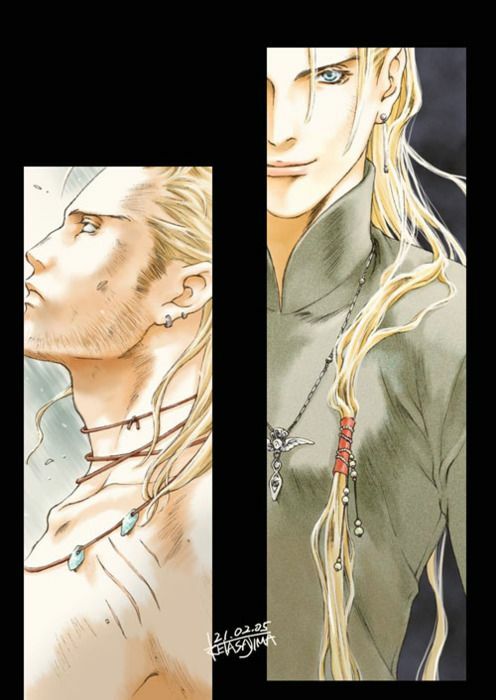 Tall, blond, regal, dolorous: my favorite combination, minus the blond part. I was always more into darker hair unless it’s silver. Silver tops everything. Edgar was also my favorite male character in that game (though Setzer is either tied or has surpassed), and I love the dichotomous twins. Sabin is jocular against all odds in the face of his brother’s melancholia, and while Ed is a more watered down version of Edge from FFIV in terms of cockiness and (potential) womanizing, his twin brother is literally a monk, the same FF archetype as Yang (I’m going to do that “FF Archetype” post one of these days…). Edgar’s didn’t bother me as much as Edge’s, and I’m not sure why. Maybe because the king of Figaro had some genuine despair alongside it, but Edge’s background was similar, hm. I think Edgar was more mature, because when he first comes into the story, he’s been ruling/running the kingdom including the town of South Figaro, and while the feminist in me recoils at saying his behavior is harmless, it came off as more playful than threatening. Like if he ever made someone feel uncomfortable, he’d stop what he was doing. Edge seems like he’d be more of a dudebro, pulling the “I was just kidding!” card. I really don’t like Edge in case you couldn’t tell. Anyway, I love the dynamic between Edgar and Sabin and how FFVI shows how each of them cope with their devastating loss in completely different ways. Both of those ways also make psychological sense (I’m so big on that0. It’s such a seemingly easy way to add depth to a narrative and show individual characterization. What’s your favorite Final Fantasy sibling set? If you’re not an FFer (yet…I will convert you mwahaha), who are your favorite video game siblings? Sometimes I really wish I wasn’t an only child. Sigh. 3. The characters from Brothers: A Tale of Two Sons. The Ashford twins from Resident Evil Code Veronica! I need to catch up on those games. I know I can find a decent Let’s Play to watch! I know Bub and Bob! I need to watch LPs of Metal Gear. I’ve only seen bits and pieces of it, but I really like the story telling. I know know Brothers at all! Some of the Metal Gear games have such lengthy cut scenes that you might as well watch them rather than play. Kojima really feels like a movie director who ended up working in the video game industry. My copy of Metal Gear 3 came with a DVD that spliced all the cut scenes (and some gameplay footage) into a massive movie. I watched it one day when I was sick in bed and it was pretty good. Isn’t Kojima the one with that…ugh is it Normal Readus? Is that the name I’m thinking of? There’s this game where this chubby, office working-looking guy finds a baby in this weird looking chamber, and he’s standing in front of what looks like a huge drainpipe. Then it pans to show a ton of military vehicles and then soldiers. The guy looks really terrified, and I know it’s a Kojima game. It looks amazing, it was the major playing in E3 2015, and it still isn’t out yet. Palom and Porom. I won’t spoil for anyone who hasn’t played FFIV, but between the giggles and the tear-fest these two induced in me, they’re great!